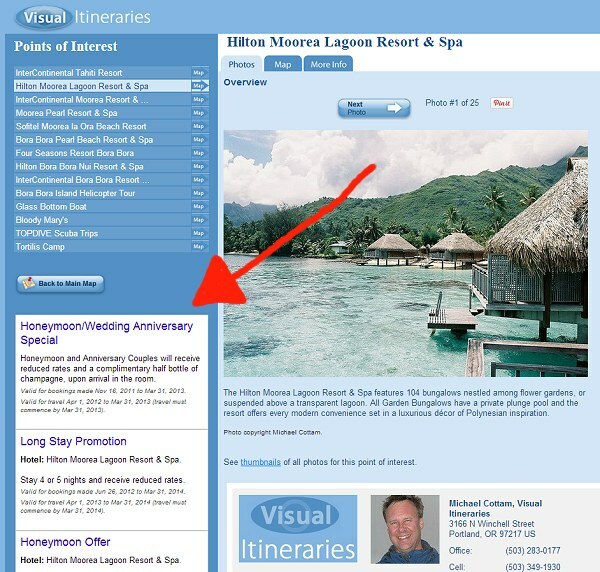 You can now show travel specials on the pages of the itineraries you create for your clients. IMPORTANT: this NOT turned on by default; if you’d like to take advantage of this feature, you need to edit your profile in Visual Itineraries…there, you’ll see a list of tour operators you can choose from. If you don’t choose any–no specials will be shown. The system will automatically look for specials loaded in our database that match the hotel or destination that the client is looking at on that page of the itinerary. So, for instance, if there’s an air special for Fiji, and a stay 7/pay 5 for Castaway, when the client is looking at the Castaway page they’ll see both specials; if they’re looking at Likuliku they’ll just see the air special. And they’ll see nothing if YOUR preferred suppliers don’t have any specials that match. These are the same offers that are shown to you when you’re editing a client’s itinerary, and the “Offers” button shows next to a resort in your list. Next obvious question…where do we get the specials? We’re pulling them from the emails and websites of some of the major wholesalers, such as Travel Impressions, Classic, and Down Under Answers. This entry was posted in Travel agent tips, V.I. News by Michael. Bookmark the permalink. Founder of Visual Itineraries, Michael lives in Portland, Oregon.